Hannah Genders takes a trip to an African paradise – just up the road from here! There is one thing about plants and horticulture: it’s such a massive subject that there’s always more to learn and know. This is true for me with a group of plants called “exotics”, which I thought I didn’t know very well – but following a recent visit to a specialist exotics nursery called Akamba, I found I recognised quite a few. Many of our ferns, perennial grasses and bamboos come into this category and most of them are hardy (they will happily go through our winter) although some are tender (needing winter protection like a greenhouse or conservatory). Either way, they are a fabulous group of plants and you won’t find a more exciting place to see them displayed than the Akamba nursery. Akamba is the brainchild and passion of Chris Canaan, with whom I managed to catch up at the nursery to talk about his love of exotic plants and all things African. Chris has managed to create, in the unlikely setting of Dickens Heath near Solihull, is a stage set of all things African – from exotic plants to African art and rustic shelters. The whole experience really is like stepping into another world and is well worth a visit. On the afternoon I was there, plenty of visitors were happily sitting under the grass roofed shelters sipping tea and Kenyan beer whiling away the hours as the children ran around the winding paths. It is Kenya that has stolen Chris’ heart, and he visits every year to buy more plants, art and artefacts for his shop. All of these are fairly traded and he personally ensures that they come from reliable sources and that the money goes back to the people who make them. Chris has had a very interesting and diverse life before he ended up in his current role, from speed skating at the Olympics to physiotherapy, personal training and fashion design. He explained to me that it’s the drama of designing with plants that he loves, and he has done it to great effect, not only at his nursery but also at Gardeners’ World Live where he has won two medals in the past few years. So what about the plants? Well, they aren’t set out in rows but are artistically displayed in groups of different sizes and shapes to give a truly jungle-like feel, clearly labelled to show which are hardy and which tender. There are plenty of friendly staff around to answer questions; in fact as far as I could tell some staff worked on a voluntary basis because they just loved to hang out in the place – including Phil who takes his pet parrots up every day for visitors to enjoy! There are gigantic tree ferns from four to three hundred years old, banana plants with the most wonderful red leaves, and everything from stems to smaller ferns, some of which you will recognise (like the stunning Ostrich fern) plus more unusual varieties like Athyrium ‘pictum’ which has lovely silvery leaves. Giant yellow and black bamboos tower over one area of the centre and there’s a whole section of cacti and desert plants to choose from. The flowers are truly exotic too, like flowering ginger, Cannas and Red Hot pokers – these colours are not for the shy gardener. If you think I sound impressed, I was, especially as all these wonderful unusual plants have full-sized gorillas and giraffes made from recycled tin sheets displayed amongst them. 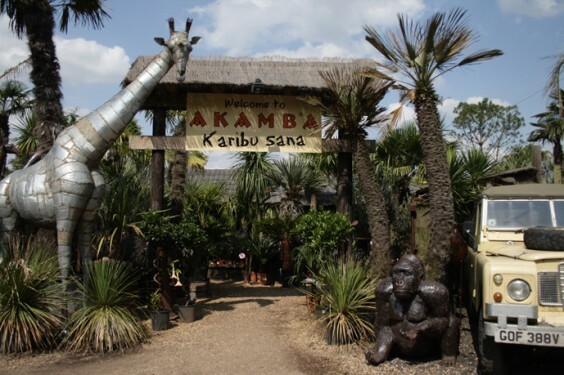 If you want to see more than just plants, Akamba holds one of the largest collections of African art in the UK and Chris is planning expansion at every level, from a new exotic animal enclosure to a Caribbean restaurant alongside his cafe. The passion doesn’t stop there: in trying to expand people’s love for exotic plants, Chris has also been planting up areas all over Birmingham. The first exotic traffic island, near Edgbaston, was planted by Akamba along with a graveyard in St Paul’s Square. When I specifically asked Chris what it was about exotics that interested him more than any other plant group, I liked his reply – he explained that plants were a bit like people, and the native population needed a few imports to add some colour variety to the mix.